The new Entree Phone 603 allows you to open your front door or gate from a handset in the house, using wireless technology. 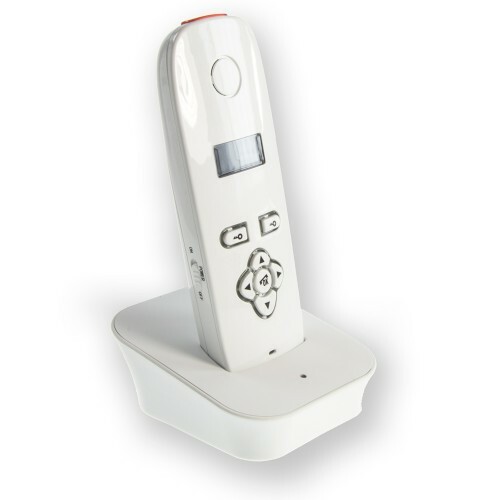 With up to 4 handsets, the intercom system is activated when the visitor presses the button on the outside system which then calls the handset inside your home. With one press of a button the door or gate will re-lease, allowing a visitor to enter a property, without you having to go and great them. 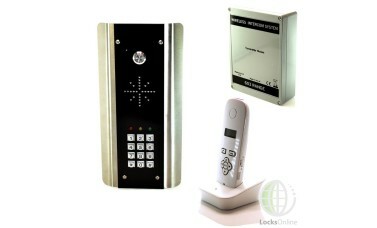 The Key-less access system also has a benefit of a keypad, allowing all members of the house accessibility at all times. With a working range of 250 meters (400 meters open-field), the handsets also have a built in voice-mail service of up to 16 missed calls, with handset play back. Hi guys! 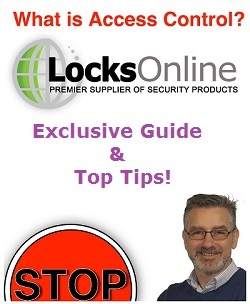 My name is Darrel and I'm head of the tech team here at LocksOnline. 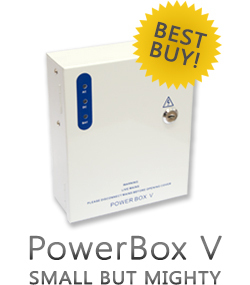 Thanks for taking some time to tune in and have a look at one of our product review videos. Now, we're putting these short little videos together to be able to give you, our customers, the opportunity to see the products that we have to offer, and hopefully a little bit more detail, or in the flesh so to speak, and we can explain to you how these particular products work. 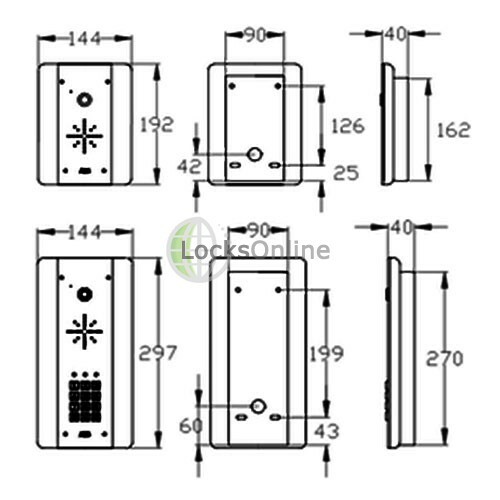 Today I want to show you a new, exciting product that we have from the manufacturers AES; it's a wireless door intercom system. It's a single door intercom system, so only one channel, so to speak, but it does allow you to have up to four handsets. So, it comes as a standard kit with one handset, and you can actually add up to an additional three handsets. This is the actual core station here as you can see. Now, this is the keypad version. They do do a smaller one as well that doesn't have the actual keypad. 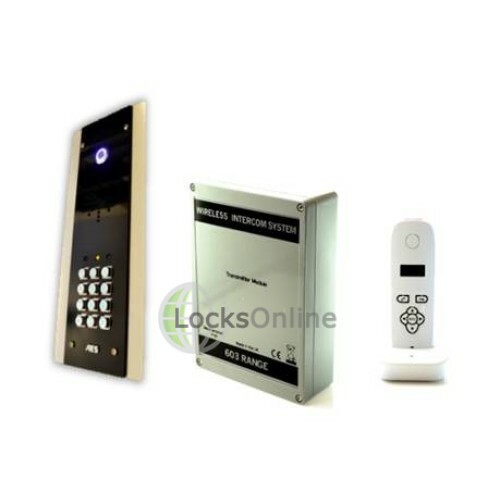 So therefore then the keypad would allow you to come up to the door and punch a code in and allow you to open the door. The actual core button at the top there is what actually then calls this particular handset here. Now, on this handset, we've given you a couple of ideas of the features. On the top here, we have a flashing, red LED. So, when it comes to for DDA requirements, etc., there's a visual indication that the actual system is calling. Also, it vibrates as well. Therefore then, it gives you a feeling as to whether or not somebody is at the door, and of course you hear an audible tone. So it's giving you all the three senses that you would expect to see. Now what you have here is some manual options as well, but probably the most critical one is that you would press this button here to be able to answer the call, and this button here allows you to release the door remotely via this particular unit. It comes, as you can see, this lovely charger, we've got this plugged in here. It's a bit of an ad-hoc sort of setup just to give you guys an idea exactly what exactly it entails. So we have a look at that a little more in detail a little bit later. Now, this is the call station. This is the part that the customer, or the person coming to the door, would actually see. And therefore then, by pressing that button there, this is then hardwired to this particular unit here, which invariably is mostly actually fitted in the house. So what you would have is this out on the front wall, and then you drill a hole through the back of this particular unit here powered by its own power, is what's actually transmitting the radio signal. Now, when it comes to the actual length of the radio signal, we're looking at something in the ranges, the manufacturers are claiming 200 meters in free, open space. Now, as a rule of thumb, you would normally take anywhere between 10, 15, maybe 20 meters off per every wall that the actual signal has to pass through. One of the things that the manufacturers are able to do also is to help by doing some sort of surveys and so forth. We'll have some more information on that a little bit later, and also in the descriptive text on our webpage. So when we actually come to actually setting up this and showing how it actually works, etc., all we would need to do is press that button there, and this is then sending a radio signal through to this particular device here, and as you can see, we have then it flashing there, and you can feel it vibrating, and obviously then to answer the call, I press that button there, and now I'm able to now speak to the actual front door, and therefore then if I want to let somebody in, I then press that button there. 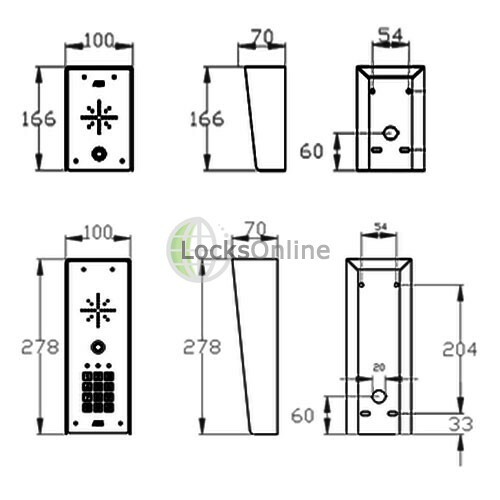 That operates the relay and therefore then now the door is now able to be opened. When I finish then, I press that button there, and now I've ended the call. So it is as simple as that, and as mentioned, you can have up to four of these handsets on the one core channel. The actual connections for your door, etc., is actually down here. You can see here, I know if you can actually zoom any closer up, but you can see the contacts down there, they are normally open, normally set at closed contacts that you would expect to see. 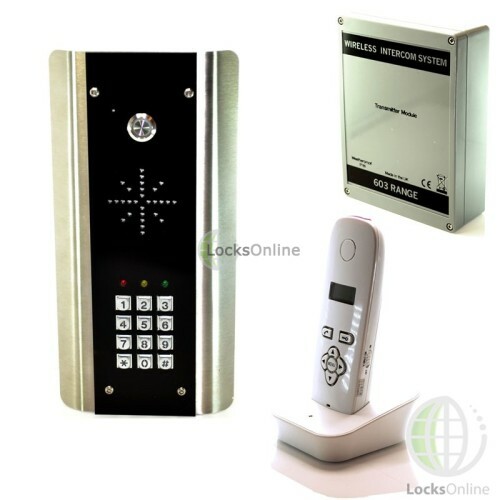 You need to get a power supply, and whatever you decide to drive through this thing, whether it be a striker release or a door mag, etc., but this would allow you then the interface between the intercom and the actual form of locking solution. So, there you go guys, just one of the exciting products that is available on our website now from the manufacturers AES, but if you need a bit more information, if you want a bit more of advice, pop us over an email. Use the live chat that you have, it's totally free. You can speak to me or any of the guys if you've got some technical information that you want to know about, or you can always do it the old fashioned way and pick up the phone and give us a call. Either way, we'd love to hear from you, and more importantly, we'd love to see you as one of our customers. So, from me Darrel, and all of us at the team, thanks for taking the time to tune. Catch up with you really soon. Take care now, bye bye.